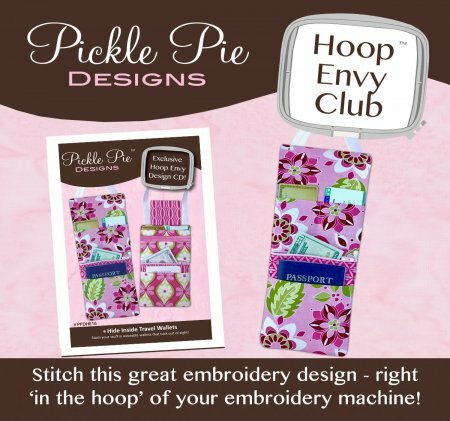 The Quilter's Cottage is excited to present Pickle Pie Embroidery Club. Geared for lovers of Machine Embroidery, the club features sophisticated 'in the hoop' designs, specially created to take advantage of the big hoops available on today's embroidery machines. Each monthly EXCLUSIVE Design CD features an irresistible project in multiple sizes so even smaller format machine owners can join in. Customers pay a yearly membership fee and can purchase the monthly Design CD's at $10 off retail. Design CD's are only sold by member Club Shops. You only need to purchase the designs you want throughout the year. Each month we will display stitched samples of that month's collection ahead of time, and will hold a demonstration/hands-on class on a specific date. Reserve a space ahead of time (space is limited!) and you can attend the demo/class at no charge. Discounts will also be given on additional Design CD's, featured notions, and kits for projects. In the Hoop embroidery lets your embroidery machine do almost all the work, and the finished projects make perfect gift items.